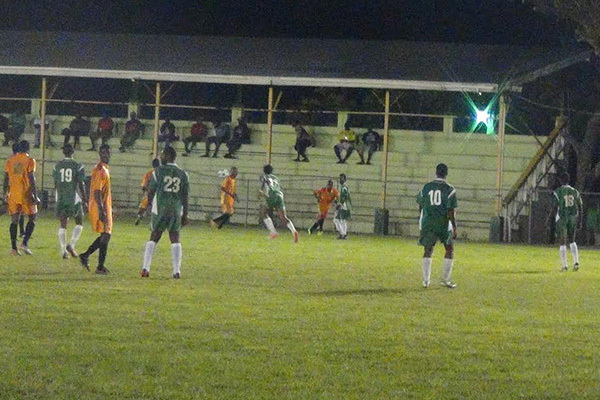 The last time the two teams met, Highlights Int easily defeated CCC Bath United 4 goals to 2 and so could be forgiven for wondering what all the hype was about as the two teams faced off again in round two of the Nevis Football Association league. The match was billed as a huge encounter, with the two teams arguably playing the best ‘ball’ in the league. There was a large crowd on hand to witness the event and they were treated to a really intense game. Dale Farrel got the break for the CCC Bath United team during the early exchanges and ran through to leave goalie Pas Turner flat footed. The score line: 1 goal to nil in favour of the Bath team. However, the Highlights supporters did not panic as they were confident that they would rebound. As the moments ticked away, things became almost desperate for the Highlights team as the CCC Bath United defense defended stoutly. Both teams also blotched scoring opportunities along the way. However, at the final whistle, the Bath team was the one celebrating.